Genuine differences do exist between Maori and Pākehā, men and women, Left and Right – but so do networks of interlocking relations, shared values and mutual dependencies. Rather than excluding the middle ground, the challenge is to get these operating in ways that are mutually positive and creative, not hostile and destructive. From 1 May our young people can be paid as little as $11.00 per hour as the Minimum Wage (Starting-out Wage) Amendment Bill takes effect. The $11 is 80% of the recently increased (by 25c) minimum wage. 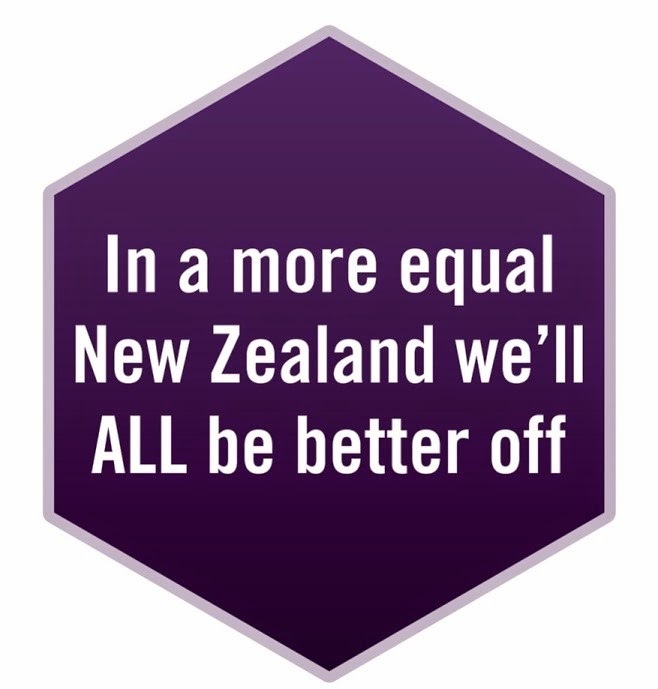 Tom Scott (Feb 28) seems to think the minimum wage increase is rather paltry. Same Work Same Pay Spokesperson James Sleep says "98% of submissions were opposed to cutting the pay of young people; however the majority report … recommends bringing in youth rates on 1 May 2013." In the ‘unbelievable contrast’ department, Mighty River Power boss Doug Heffernan is getting a $500,000 bonus for “steering the company through its partial privatisation ….” Maybe there could be something in this if he was badly paid, but he already gets $1.5 million without the bonus. Even if Doug Heffernan works 60 hours a week, 52 weeks per year (3,120 hours), he will still be getting $641 per hour. That’s the equivalent of 58 young people or approximately $11 per minute. It doesn’t stop there. Lesley Longstone who was head of the Ministry of Education is getting paid $425,000 to go away and stop bothering the Minister of Education about it being “too early to determine the optimal approach for some [Christchurch] school clusters" and other matters. Labour suggests Lesley and the Minister could have plenty of relationship counselling for these dollars, and the Green’s aren’t impressed either. Then there is Paula Rebstock being paid over $100,000 for a part time job investigating leaks about Foreign Affairs restructuring last year. This is on top of being paid for being chairwoman ACC, the Work and Income Board, deputy chairwoman of the New Zealand Railways Corp, and chairwoman of the Insurance and Savings Ombudsman Commission. Given the way we are treating our young people, it is no wonder we have to take more notice of their mental health. The three most important determinants of mental health are social inclusion, freedom from discrimination and violence, and access to economic resources. It is good government is providing accessible mental health assistance to young people, but as long as we seriously disadvantage groups of our young people, the mental health problems are not going to go away. Our inequalities are being noticed by others around the world. Here at home, Greg Coyle asks four pertinent questions about whether our income distribution is fair. The first one (paraphrased) asks, ‘given the current distribution of income, would the most advantaged in society accept the distribution if they suddenly found themselves to be the least advantaged in society?’ Would our corporate executives willingly swap places with youth rate recipients? We think not. A new overseas study suggests “the largest contributor to increasing income inequality…is the wealthiest getting increasing amounts of money from financial assets.” “The sharp effect of capital gains [is] more than enough to cancel out [any] wage [increase] equalizing effect.” Here we are assisting the wealthy, by giving Wanganui Collegiate 3.1 million despite the Minister of Education labelling it a bad idea. Perceived discrimination has a negative impact on both mental and physical health. So a whole lot of people on benefits feeling they are being discriminated against is not a good idea. A recent survey found 74% of people think people on benefits are facing discrimination. In the UK, they are even using language to differentiate between deserving and undeserving people on benefits. Maybe there is good reason for them to feel ‘got at’. The Minister of Social Development is trumpeting yet another reduction in numbers of people receiving benefits. The main idea behind benefit reform was we would get people off benefits because they got jobs instead. Unfortunately, job-availability has taken a bit of a nose-dive, so finding the elusive job is tricky. Undaunted, we keep pushing people off benefits, or avoid letting them on. We even make a feature of avoiding benefit fraud, despite the Audit Office’s report about fraud being a very small part of the Ministry of Social Development’s debt portfolio. There are three new initiatives. First, we’re going to prosecute “partners who profit from welfare fraud [to] ensure that both parties who profit from the crime are punished, [so] the taxpayer recovers the lost money faster.’ Then, beneficiaries deemed previously dishonest with MSD will face greater verification of their information and less access to self-service transactions. Finally, information links between Inland Revenue, Housing New Zealand Corporation, New Zealand Police, and the Ministry of Social Development will be formalised. More details are here. Beneficiary advocacy groups are concerned changes in the way fraud is to be investigated constitute a breach of human rights. Along with others, NZCCSS is really concerned some of our most vulnerable citizens are being refused benefits in the quest to keep the numbers down. Labour reports pressures on sole parents. Some people who need assistance will not get it because getting through the benefit eligibility maze is tough without help, and some of the help is under threat. Government says funding to the Beneficiaries Advocacy and Information Service who provides the help is not being cut, but this organisation, like many social services, is coming to the end of its Community Response Fund grant, with no replacement dollars in sight next financial year. Meantime, significant numbers of people are having benefits cut because of ‘failure to reapply’. Government has some specific goals and will focus on these. There are government’s better public services goals, number one of which is reducing long term welfare dependence. There are also government’s health targets, particularly District Health Board targets. Government is focusing on these too. Keep these two things in mind to understand what is going on. Struggling people who leave the welfare queue because it’s all too hard, intimidating, or they have been declined assistance, tend to pop up elsewhere. One ‘elsewhere’ is the hospital emergency department. Put it all together, and it is not surprising we have the ridiculous situation featuring homeless people being treated in hospital and then discharged to night shelters. Another Government goal is more children in early childhood education. It is delighted about increases in numbers. Some may be children of lone parents required to look for work. Numerous groups are concerned about the pressures on these parents. Quality, affordable, accessible, appropriate, early childhood education is a good idea. As Laura Black from Dunedin Methodist Mission points out, early brain wiring is crucially important. Labour reports more and more of the cost of early childhood education is being pushed towards parents, many of whom cannot afford the funds. It’s hard to write about Canterbury. Thank you to Beck Eleven for her timely advice: “…We are done with being called resilient. We are done with "kia kaha" and quite frankly, I'm not sure we were ever "stoic". The majority (97%) of greater Christchurch residents have experienced stress in the past 12 months that has had a negative effect on them. Almost a quarter (23%), say they have experienced stress always or most of the time during this period. Christchurch has the greatest number of people (35 per cent) who say their quality of life has decreased "to some extent" or "significantly" in the past year, compared to the 21% national average, according to the Quality of Life survey of people in Aotearoa’s six largest cities. Despite all this, 66% of Christchurch’s population is pretty happy; not significantly different from the 71% of the six cities as a whole. Across the country there has been a large increase in the number of people who say they do not have enough money for their everyday needs, up to 22 per cent from 13 per cent in 2010. In Canterbury, “financial struggles are increasing: more families are seeking food parcels and requesting special assistance. ’Families are proud and do not like to ask,' says [Caritas], 'but they have been worn out from two years of trying to make ends meet. From 1 March, 2013, the National Certificate in Youth Work (Youth Leadership) (Level 3) will be delivered to trainees via the workplace. Careerforce has created new learning resources and assessments which are available via Careerforce's online learning site, ilearn. Trainee assessments are free from the Careerforce website. The National Certificate in Youth Work (Level 3) attracts the Assessment Support Payment – funding of around $11 per credit paid to the workplace upon a trainee's completion of the qualification. The Assessment Support programme is designed to help workplaces support their trainees training and assessment. Increasingly houses may become places for ‘person’ to live in. Housing New Zealand is planning to have fewer three bedroom houses and more one-bedroom units. More info about this is in its recent briefing to new minister Nick Smith. There will be many older people in our communities in the future. The Public Service Association thinks we are not addressing their needs properly and refusing to address underfunding, low pay and pay inequity in the aged care sector. Other work to improve wages can be found at the Living Wage Campaign website. 1. Managing Change in small community organisations: Workshop 17 April 2013 Wednesday 9.15 am to 5 pm Cost: $150 plus GST , Te Atatu Boat Club, Bridge Ave, Te Atatu, Auckland, for small trusts and incorporated societies with a few staff, often volunteer based. Opportunities of Ageing Conference Hastings, 10th -11th April. Hastings District Council is hosting this event designed to explore the social, economic possibilities of our ageing society. "Ralph [Hotere] is one of those people like Colin McCahon who built really solid bridges between two of the main rivers in our cultures. … he was a fighter for great causes, he was what you expect an artist to be - he changed our lives."